Accurate evaluation is the first step for greater productivity – We bring you easy to use , high efficiency devices to improve the output from your compressed air systems in a significant manner. You can test your MGPS systems for – purity of compressed air , measure the volume of gases consumed and more. 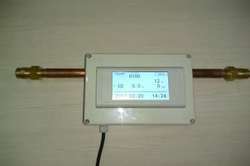 To measure the real time gas consumption of Gases in lpm and cumulative gas consumed in cubic meters. Ideal to measure the gas consumption by Individual Departments and Total Gas Consumption by entire Hospitals / Institutes. Looking for Gas Consumption Counter ?